Purple and gray wedding invitations have never looked better. Stephanie’s design inspiration came from her love of all thing baroque. The purple ornamental swirls make these classic wedding invitations into a piece of art. Stephanie wanted the ornament to be in places in each part of the invitation, but in different ways. One of my favorite details for wedding invitations is designing custom postage. This stamp is designed to fit the ornamental swirl of the envelope! It’s like a piece of the puzzle. You can see lots of my stamp designs on Zazzle.com. 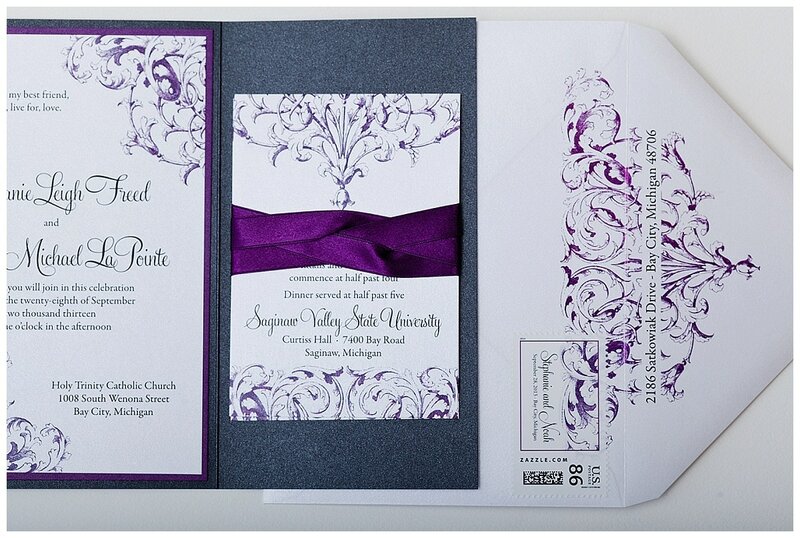 Purple and gray wedding invitations is a beautiful combination. Purple can sometimes look for more fun than formal on invitations. Paired with gray and used for the graphics, I achieved the formal feel that Stephanie wanted for her classic invitations. Stephanie’s purple and gray wedding invitations are a gatefold invitation. It opens like a gate – get it?! The inserts are tied into each side of the gate with a yard of purple ribbon. The ribbon is woven into itself and is just another custom detail that makes the invitation one your guests will talk about for years and years to come! Want to see more purple invitations?